After four years together, The Magic Gang suddenly find themselves at the forefront of 2018’s breaking guitar bands. Nominated for Best New Artist at the NME Awards, the young quartet have a trio of Radio 1 Hottest Records to their name, and have toured with the likes of Wolf Alice and Sundara Karma. And to top it all, The Magic Gang are about to drop their self-titled debut album. It’s a collection brimming with uplifting pop hooks, sweet vocal harmonies and youthful exuberance, and one that echoes everything from Beach Boys and The Kinks through to Weezer and Pavement. At a time in which the guitar band is an outsider in the realms of pop, The Magic Gang inspire devotion and adulation in equal measure. It’s a far cry from the band’s early days. They shared a knackered, four-floor abode in Brighton in which new residents – almost all connected to the town’s vibrant music scene – arrived and departed in what must’ve felt like a revolving door policy. Completed by Kris Smith (guitar/vocals), Gus Taylor (bass) and Paeris Giles (drums), The Magic Gang were soon making waves. After two independently released EPs, tours to every corner of the country and beyond, they attracted the attention of The Maccabees’ guitarist Felix White who first saw them play as support to Wolf Alice. “There was something instinctive about liking a band before they’ve even got through their first song,” he told DIY shortly after they signed to his new label and club night Yala! Records. A succession of EPs and singles meant that The Magic Gang had already released an album’s worth of tracks before their thoughts turned to recording their debut. Creating a collection that included both fan favourites and previously unheard material was a really difficult balancing act, especially as all four members are constantly writing. The later songs written for the album – ‘Caroline’, ‘I’ll Show You’ and ‘Take Care’ – are slowburners which yield greater power after repeated plays. 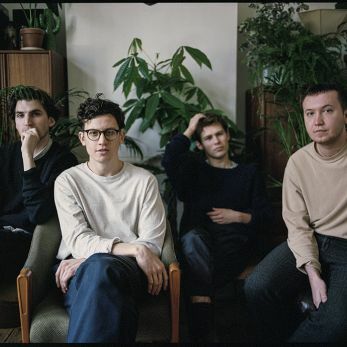 Sporting an Elton John piano melody and a rhythm with a touch of an R&B influence to it, ‘Take Care’ also represents the first Magic Gang song to feature lead vocals from Gus. It’s an anomaly in as much The Magic Gang usually write about the experiences of their friends, or stories that they’ve chanced upon in the news. ‘All That I Want Is You’ is different still, as Kris and Jack found inspiration in stories from Brian Wilson’s controversial autobiography ‘Wouldn’t It Be Nice’. “Oh Brian, won’t you come out?” are the final lyrics that emerge from the album – a reference to Wilson’s obsession with spending hours on end in his swimming pool. The majority of the album sessions took place at Angelic Studio in Northamptonshire. The Dirty Projectors’ latest album was a common soundtrack, while Frankie Valli & The Four Seasons, The Four Freshman and Steely Dan are all shared passions. But The Magic Gang are a band who appreciate song craft rather than genre, so you’d be just as likely to catch them listening to SZA or J Hus rather than anything from the past. When it came to re-recording established favourites such as ‘Alright’, ‘All This Way and ‘Jasmine’, the band called on producer Jolyon Thomas (Royal Blood, Slaves) to capture some of their live energy on record. His solution was deceptively simple: by encouraging them to perform live take after live take, they struck that perfect balance between precise performance and spontaneous spirit. Whereas other bands feel like a frontman backed by three random others, The Magic Gang are more than the sum of their parts. Jack believes that he and Kris are the more neurotic characters of the band, but creatively are the ones most likely to instigate an idea. By contrast, Paeris (who also deals with a lot of the band’s visuals) and Gus have the ability to develop those ideas to their full potential. “It’s amazing to know that if you’ve got an idea, you have a full team who are going to work together to make that song as good as it can be.”That connection has gifted The Magic Gang with a unique trait. Their big hitting songs can stand tall on any playlist, yet they’ve also created an album that you can be immersed within from start-to-finish. All things suggest that you’ll be hearing a lot more from them as the year unfolds.